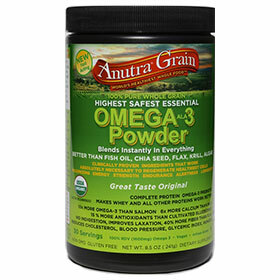 ANUTRA’S Omega-3 delivery system is the only one approved by both the FDA and USDA and is classified as a regular food, like wheat, corn, oats and rice. ANUTRA has very little taste (a slight mild grain flavor) that takes on the taste of the existing flavor profiles and digests beautifully with no side effects like flax, fish oil and algae. 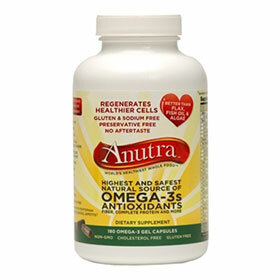 ANUTRA is a sustainable natural source of Omega-3s. ANUTRA’s clinical studies show a positive results in lowering blood pressure, body inflammation (CRP levels) and blood thinning (aspirin effect) and in reducing the risk of heart disease, cancer, diabetes, osteoporoses and more. ANUTRA will not raise blood sugar levels (Glycemic Index). Anutra’s nutrient dense qualities have been clinically proven to significantly improve metabolic control of diabetes. In an acute study, after-meal blood glucose and plasma insulin levels were reduced thereby improving insulin sensitivity. In a long term trial, blood pressure was reduced. High blood pressure is the major cardiovascular risk factor in those with Type 2 diabetes. ANUTRA contains L Arginine, a vasodilator that reduces blood pressure and phyto-tryptophan which decreases appetite; promoting weight loss. It is estimated by experts that if everyone in the US consumed 2 tablespoons of ANUTRA and exercised moderately every day, healthcare costs in America would decrease by 50% !! !